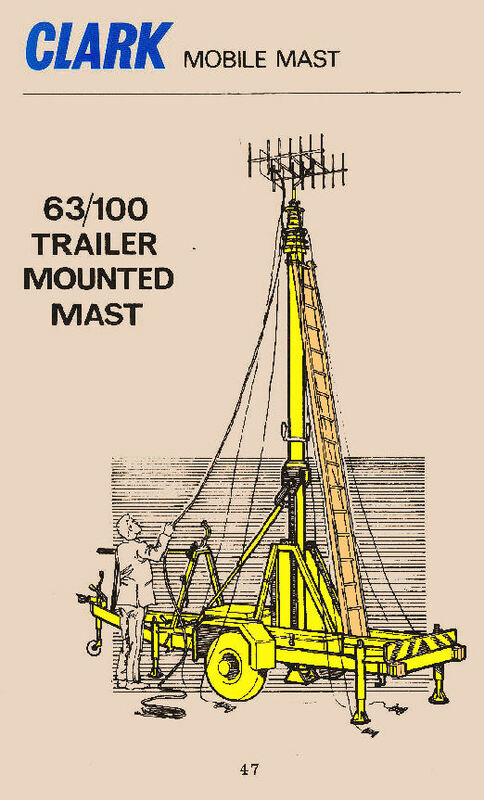 Illustrated in this web page, for historical purposes, is the 30 Metre Type 63/100 Trailer Mounted Mast page from Clark Masts early 1970's catalogue. Today's equivalent to the model 63/100 is the Model 802/30. 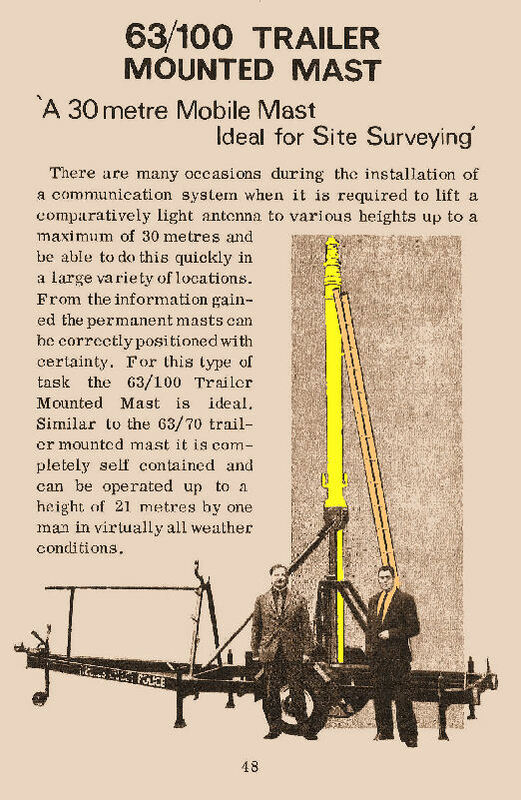 The Clark Masts Type 63/100 Trailer Mounted mast of the late 1960's - early 1970's was designed to lift heavy duty loads, using a 30 metre 11.4Kg headload rated model WT8 mast. Extending the mast to only 20 metres allows headloads of up to 27 Kg to be lifted. The 63/100 was particularly designed to work with radio site survey teams and communications centres for emergency services etc. 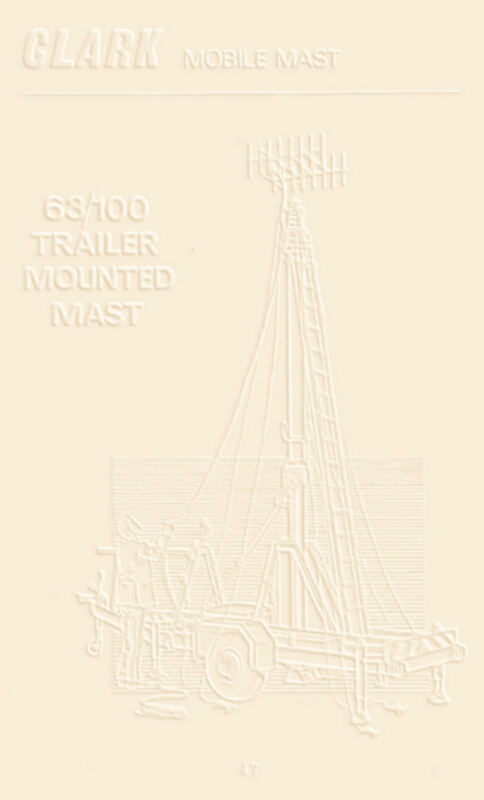 Like all other WT Series masts the 63/100 Trailer Mast's mast sections were keyed to prevent inter-section rotation, making it suitable for use with directional headloads such as yagis and small dish antennas. The 63/100's extended height of 30 metres was obtained using 9 sections which also provided a retracted height of 4.87 metres. Being a WT Series mast, the 63/100 Trailer Mast's base tube diameter was 152 mm (6"). 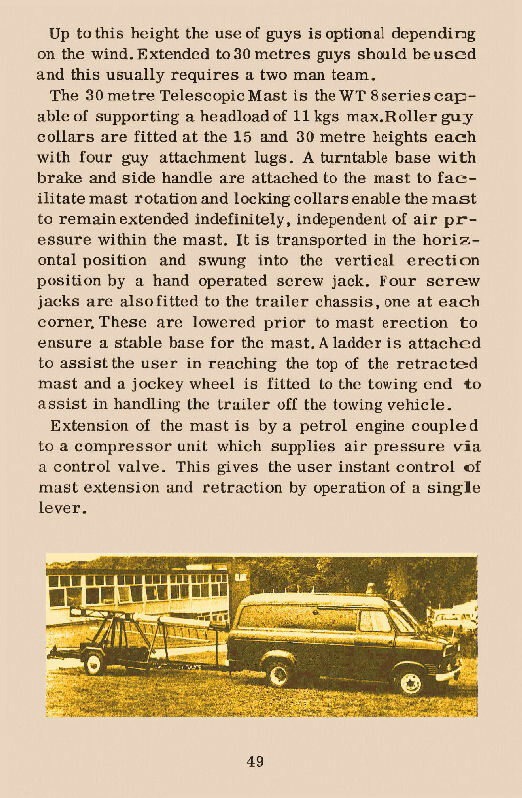 A petrol operated Compressor/Mast Controller was incorporated for mast extension/retraction and the mast was lifted into the vertical by a hand cranked screw jack. The Clark Masts type 63/100 Trailer Mast was supplied with all the components necessary for it's deployment. 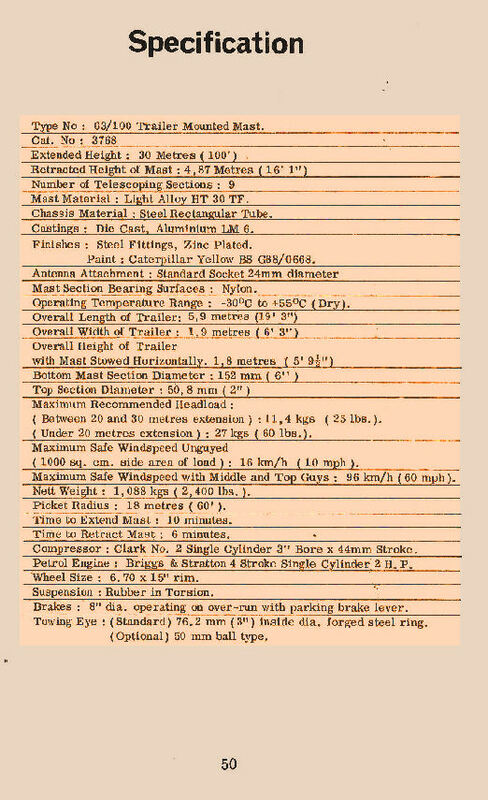 These included Guy Assemblies, Guy Stakes, Guy Stake Hammer, Guy Stake Location Line, Base Plate, Base Plate Spikes, Mast, Weather Cover and screw jack Crank Handle. These deployment accessories were stored in a steel tool box fitted to the trailer frame. A deployed 63/100 Trailer Mast had a wind speed rating, with 1000 square cm sail area on top into wind, of 16 km/hr un-guyed and 96 km/hr when guyed. The specified time taken to extend the mast using it's petrol compressor was 6 minutes.